To be a dark-skinned black woman in America is complicated. The deep-rooted history of racism and colorism in the world has torn families apart, pitted people of differing hues against each other, and even relegated those who are considered dark-skinned or “black” to positions of servitude. In the aftermath of enslavement, black women who didn’t pass the “paper bag test” were often perceived by those who are non-black as angry, uneducated and ugly. This actual test was used during the early 1900s. If a woman’s face was darker than the bag, she was ostracized. Thousands of night clubs, churches and schools practiced this form of discrimination. Dark-skinned black woman have been systematically eliminated from the world of beauty through this kind of racism and colorism. They have become victims of widespread stereotyping, affecting their emotional growth and development. So it’s quite refreshing and timely to see Sampson, with the help of director Leah C. Gardiner, shake up American soil by way of a remixed West Africa fable, with a fresh new look at beauty and blackness. 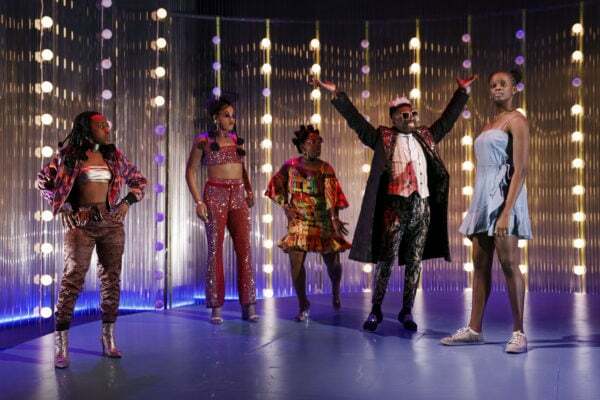 In Affreakah-Amirrorikah–the telling setting of Sampson’s play, Akim, (Níkẹ Uche Kadari) the modestly dressed, dark-skinned girl with afro-puffs and cornrows, is the village’s depiction of physical perfection. Her beauty “reigns supreme” in this community while her lighter-skinned classmates, Massassi (Antoinette Crowe-Legacy), Kaya (Phumzile Sithole), and Adama (Mirirai Sithole), envy her and fruitlessly vie for love and attention in over-the-top ways — often losing their own spotlight in doing so. They want to be her, while Akim screams in frustration “Take my beauty away from me,” wishing her light could be dimmed just to fit in. Akim was raised to believe her beauty should be locked away and “preserved,” leaving her feeling trapped. The problem, however, between all the girls is that in looking at their outward appearance they become caught in a web of illusion. Beauty is felt more than it is perceived. The production blends African and American cultures in the village of Affreakah-Amirrorikah. Akim’s parents are adorned in traditional African dress, while Akim wears a simple denim dress. Her classmates are outfitted in bedazzled urban wear. Costume designer, Dede Ayite, shows us that beauty comes in various forms and fashions. The production uses American music which is played over live African drumming which again layers these cultures and histories and shows us the musical parallels between them. Though spiritual music is an integral part of the African-American experience, the play loses focus when an extremely long gospel rendition distracts from the main story. Overall the blending of musical genres adds depth to the culture of the characters. The name of the village of Affreakah-Amirrorikah gives the audience more to think about. Sampson uses mirror to spell out America in her allegory because she wants her audience to reflect on the historical context and the painful realization of what it means to be pretty and ugly today. She uses freak in Africa to symbolize the unfair, negative connotation put on African and black women everywhere. These harmful stereotypes around black beauty impact black women all over the world. The cast generates a fluid creative energy. They interact with each other as if they are old friends; maybe they have done this before or lived this story with each other. Among the overall strong cast, Antionette Crowe-Legacy as Massassi is magnetic. She struts about the stage with a cocky air and full confidence. Though she plays the sassy, overly jealous teenager on the exterior, we also feel sorry for her because her insecurities are familiar. This world is not ideal for anyone because physical appearance has no direct correlation to perfection. No one truly wins in the land Affreakah-Amirrorikah, except the audience. We watch from our seats and are challenged to confront our personal perceptions of beauty as vanity lights on stage, designed by Louisa Thompson, bare through our souls. In the final scene, a glass-less mirror appears on stage encouraging us to free ourselves from traditional beauty standards and no longer be slaves to our physical looks. Though, If Pretty Hurts challenges all attendees to look deeper than their appearances, Sampson succeeds in speaking directly to black women who have been, like the continent of Africa, a victim of exploitation and colonization. Now is the time for change, after all, beauty is a vague concept.